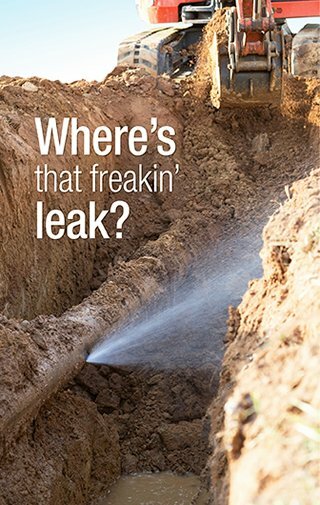 There's an unwritten rule in the universe: pipes will spring a leak in the middle of the night, during a three-day weekend, or on the day your mother-in-law arrives for her weeklong visit. Even worse, those pipes will be tied to your radiant heat system and it's the dead of winter—or, worse yet, they will surely deliver a knockout punch with a sewage disaster. Those are the types of calls Christian Macaulay, owner of American Leak Detection in San Rafael, and his Marin County team have the pleasure of answering 365 days a year. "By the time homeowners call us, they've usually called their contractor, their landscaper, or their plumber, and they're already out $500," Macaulay says. "It's not surprising if they let out some of their frustration on us." And what's not to be frustrated about? Plumbing and radiant heat systems in Eichlers and other MCM homes are typically 50-plus years old, and by that age, things are bound to break down. Homeowners keep patching and nursing their systems along because the alternative—complete abandonment or replacement—is hard to stomach. The cost and work involved can be staggering. 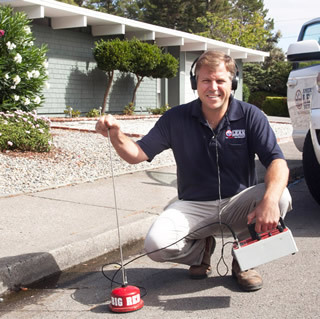 "Radiant heat systems are, by their nature, designed to eventually fail," says Hillel Salomon, owner of the American Leak Detection franchise based in Berkeley. "They are encased in concrete, and the minerals in the concrete eat away at the metal over time, and the pipes corrode." Joe Eichler used different piping materials for radiant heat systems over the years, including galvanized and stainless steel. "When we have pulled [some of] these systems out, we found more holes than pipes left," Salomon says. Copper radiant systems, in contrast, are longer lasting and more repairable. American Leak Detection's Christian Macaulay with the Marin Eichlers. Thankfully, companies like American Leak Detection can counsel anxious and frustrated homeowners through difficult times and help guide them through the tough decisions. When their technicians show up with a truck full of high-tech gadgets, that sight helps to ease homeowner worries, or at least helps them accept reality. "Technology for leak detection has not really changed. We just get more precise equipment," Macaulay says. For in-slab radiant heat systems these days, his team uses an ultrasonic listening device called the XL T99. First, they connect to the radiant system to pressurize it. As the gas begins to flow through, the technician uses the device and a set of headphones to listen for leaks. These leaks sound, to the trained ear, like rushing or bubbling water and forced air escaping. ALD collaborated with a former Grateful Dead sound engineer, Charlie Butten, to develop the XL T99, which uses highly sensitive audio filters to pinpoint sounds in pipes. According to Salomon, Butten uses his expertise to make ALD's existing technology even more accurate. "Our leak detection equipment was already the most sensitive that we were aware of, but we're always making improvements and small advances to our existing technology," Salomon says.